Famous author Joseph Castleman (Jonathan Pryce) gets a call from the Nobel Prize Committee informing him that he has just been awarded the prize for literature. Later that morning, Joe and his wife Joan (Glenn Close), their pregnant daughter Susannah (Alex Wilton Regan) and aspiring author son David (Max Irons) celebrate the news with a group of their best friends. The story shifts between past and present, beginning with the story of how young college professor Castleman (Harry Lloyd) first met English student Joan Archer (Annie Starke). Soon Joe leaves his teaching position, wife, and baby daughter, to live with Joan and attempt his first novel. Joan has obvious literary talent but is dissuaded from pursuing a career in writing by little published author Elaine Mozell (Elizabeth McGovern). When Joan becomes the struggling writer’s muse, his career suddenly takes off. The Castlemans arrive in Stockholm where pesky writer Nathaniel Bone’s (Christian Slater) offers to write Joe’s biography are summarily rebuffed. After Joe, Joan, and David check into the Grand Hotel, it does not take long for this author to get the “attention” of pretty Swedish photographer Linnea (Karin Franz Korlof). As the Awards ceremony approaches, the fault lines in the Castleman family are exposed: Joan has reached the end of her tolerance for Joe’s womanizing, while the father-son relationship is quite fractious. The film’s dramatic crux occurs during the Nobel dinner, as Joan answers King Gustav’s (Nick Fletcher) query about her occupation. Joan’s response that she is a “king maker” implies that her role in Joe’s success may have been much more than simply being his typist. This film receives an excellent transfer to the home-video environment. One of the better films to hit the big screen last year, The Wife is essentially a two-character show. Pitting screen veterans, Close and Pryce, against each other gives viewers powerful accounts of their assigned characters: Joe as the egotistical philandering celebrity and Joan as the self-effacing wife. Swedish director Bjorn Runge successfully leverages the intrinsic majesty of his hometown location while scriptwriter Jane Anderson does a fine job in adapting Meg Wolitzer’s novel to the silver screen. While conversion of the film’s negatives was performed in the digital domain, the images are very natural appearing and colors particularly during the award ceremony are gorgeous. The facial details in the many close-ups are superb. The on-location shots of Stockholm, the actual setting of the Nobel Prize Award ceremony with its pomp and circumstance, and the interior of the world-famous Grand Hotel create the perfect atmosphere for this film. The Wife is dialogue-driven and the mics got it totally right, an essential element for domestic dramas. The dts-HD MA 5.1 soundtrack puts nearly everything upfront but opens up expansively for Jocelyn Pook’s beautiful score. 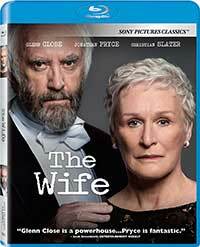 Keeping Secrets: Glenn Close on The Wife (English Dolby Digital Stereo 48kHz/16-bit) (6:37). The lead’s take on the gist of this film. In Conversation with the Cast of the Wife (English Dolby Digital Stereo 48kHz/16-bit) (38:12). A television cast interview for television by Jenelle Riley. Q&A with Glenn Close and Author Meg Wolitzer (English Dolby Digital Stereo 48kHz/16-bit) (16:19). A panel discussion that deals with the film. Whether or not Glenn Close wins the Oscar for her stellar performance, this is still a must-see film for all who appreciate consummate acting and a well-crafted script. When a Nobel Prize for Literature is awarded, but raises the question of who really should have received it. 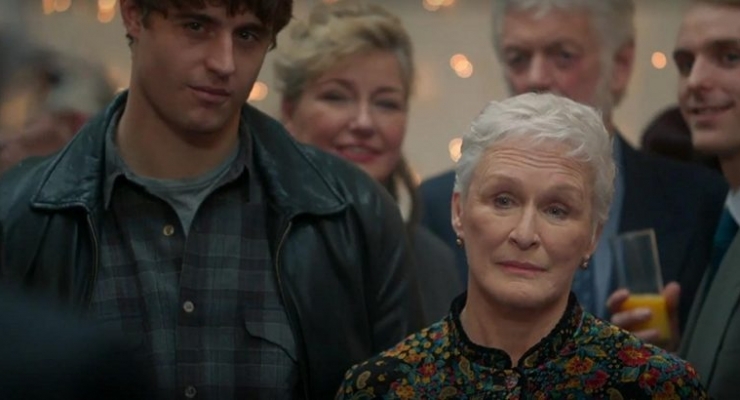 One of the best pictures of 2018, The Wife features outstanding performances from Glenn Close and Jonathan Pryce.